I am a Lecturer in Eighteenth-Century Literature at York St John University. I work on eighteenth-century political print culture, looking at cheap print, newspapers periodicals and other printed ephemera. I’m interested in the relationship between the citizen and the state, and the role that print played in transforming and mediating this relationship during the consumerist boom of the eighteenth century. In addition to examining the function that news and gossip played during this period, I am also fascinated by the role and representation of coffee house culture. At present, I am working on Whig literary culture from the dawn of the eighteenth century and regional works of protest produced in Yorkshire during the revolutionary 1790s. The latter involves many different forms of literature produced by James Montgomery: a protest poet, political prisoner, hymn-writer, abolitionist and lesser-known Romantic. Working with Dr Jo Waugh, I am also Co-Lead on 'Satire: Deaths, Births, Afterlives', a project historicising recent claims that satire is dead. 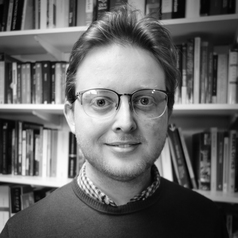 I am Media Co-Editor for Criticks, the online review hub for the British Society for Eighteenth-Century Studies, and I am Co-Lead Educator on 'The Literature of the English Country House', a Massive Open Online Course managed by the University of Sheffield.